HEAT Press Batting Together™ is happy to introduce our new product for online sales, retail and wholesale distribution. HEAT Press Batting Together™ was invented to fuse batting/wadding and fabric together to fit a specific size, to enlarge or reinforce. 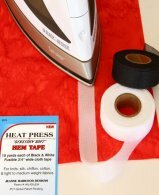 The HEAT Press Batting Together™ is 1 ½ inch (3.81cm) cloth tape on a 15 yard roll (13.7m), and will allow batting edges to be fused together with a soft fuse that stretches, eliminating the old pinning and stitching of extra batting/wadding pieces needed to fit a specific project. The product can be used on any batting/wadding fabric content. This product was invented by designer / longarm-quilter Jeanne Harwood after 40 years of business ownership experience in the development of the Sears Sewing Schools Knit Program, Apparel Manufacturing, Apparel Design, Textile Development, Quilting and Long Arm Quilting Industries. Click on images to the right to go into the online store for more product information. The video in the lower right demonstrates the easy way of using HEAT Press Batting Together™. If you are interested in wholesale orders, click here for more information. "As a long arm quilter for the past five years, I had a stack of batting pieces, some were large but odd measurements. I found the same, working with charitable groups as "Project Linus" and "Quilts for Veterans". The charities also accumulated many large pieces of left over batting. This product works to fuse these batting pieces easily without sewing with the sewing machines. 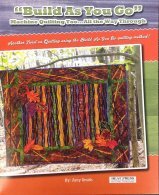 I gave cut pieces of batting tape to over 100 quilters to see how they liked the product. Based on the overwhelming response I decided to produce this product for the quilting, batting and fabric markets. The product was developed with the chemical formula for use on all quilt, batting and fabric contents. With this product quilters' will be able to use all the batting they have purchased. 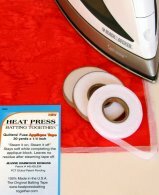 The purchase of one package of 'HEAT Press Batting Together'™ contains 15 yards (13.7m), enough yardage for at least six large quilts". 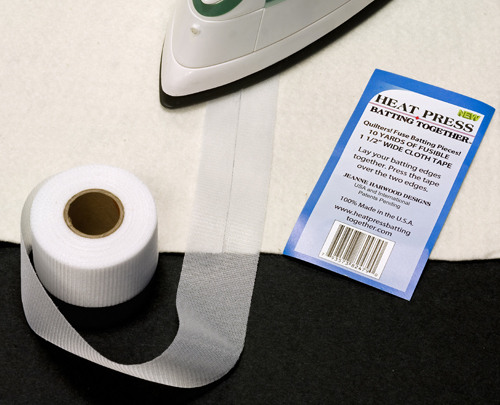 Heat Press Batting Together™ is a division of HPBT Inc. USA and International Patents Pending Products. All rights reserved.